Tiki Oasis 8 - Voodoo Vacation on Zombie Island! First up we have the Voodoo Zombie Mask. 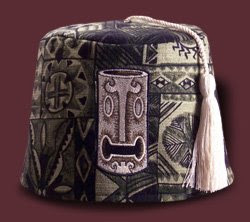 This dapper fez features the mysterious image of a zombified tiki mask on a black velvet fez. The perfect hat to pair with a white dinner jacket and a pineapple filled with booze. We'll have 25 of these available in sizes ranging from Small to 3x. Next up, we continue our disturbing obsession with primates and the undead with the Zombie Monkey Fez! This combines the irreverent fun of flinging poo with the intellectually engaging activity of eating one's brain. This year we will have a batch of embroidered shirts featuring some of my new artwork. 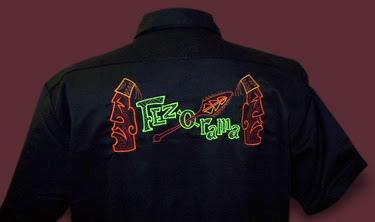 These are quality Dickies brand 2 pocket work shirts with embroidery on the back and front! On the right you can see the crest detail embroidered above the left pocket. Just one more special item we are offering to the Tiki Oasis attendees! 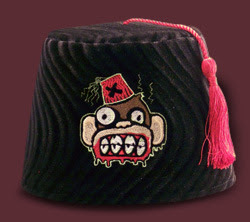 Here is the first of our special editions we're offering this weekend: The Night of the Zombie Monkey Fez! 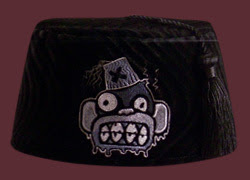 This silver screen monochrome edition of the Zombie Monkey fez is featured on a low profile smoking cap style fez. There are only 13 in this special numbered edition so if you are interested -be warned- they will go fast! The Scrimshaw Mug Fez on Bark Cloth! We went back and dug up Troy's original sketches and translated them into the embroidery and put them on tapa print bark cloth. Each of this Special Edition Fez is numbered and only 13 were made! 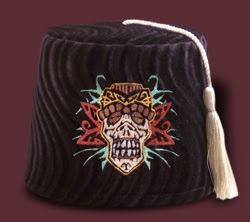 Like the special edition bark cloth fezzes we did back in 2006 we expect this to sell out rather quickly. If you are interested in getting one on your head we suggest you come see us Saturday! All of that as well as stickers and glassware will be on sale this weekend in San Diego! We hope to see you there!